Eckhart Tolle’s profound yet simple teachings have helped countless people throughout the world find inner peace and greater fulfillment in their lives. At the core of the teachings lies the transformation of consciousness, a spiritual awakening that he sees as the next step in human evolution. We hope you’ll enjoy this excerpt from his New York Times bestseller The Power of Now: A Guide to Spiritual Enlightenment. This accumulated pain is a negative energy field that occupies your body and mind. If you look on it as an invisible entity in its own right, you are getting quite close to the truth. It’s the emotional pain-body. It has two modes of being: dormant and active. A pain-body may be dormant 90 percent of the time; in a deeply unhappy person, though, it may be active up to 100 percent of the time. Some people live almost entirely through their pain-body, while others may experience it only in certain situations, such as intimate relationships, or situations linked with past loss or abandonment, physical or emotional hurt, and so on. Anything can trigger it, particularly if it resonates with a pain pattern from your past. When it is ready to awaken from its dormant stage, even a thought or an innocent remark made by someone close to you can activate it. Some pain-bodies are obnoxious but relatively harmless, for example like a child who won’t stop whining. Others are vicious and destructive monsters, true demons. Some are physically violent; many more are emotionally violent. Some will attack people around you or close to you, while others may attack you, their host. Thoughts and feelings you have about your life then become deeply negative and self-destructive. Illnesses and accidents are often created in this way. Some pain-bodies drive their hosts to suicide. When you thought you knew a person and then you are suddenly confronted with this alien, nasty creature for the first time, you are in for quite a shock. However, it’s more important to observe it in yourself than in someone else. Watch out for any sign of unhappiness in yourself, in whatever form — it may be the awakening pain-body. This can take the form of irritation, impatience, a somber mood, a desire to hurt, anger, rage, depression, a need to have some drama in your relationship, and so on. Catch it the moment it awakens from its dormant state. The pain-body wants to survive, just like every other entity in existence, and it can only survive if it gets you to unconsciously identify with it. It can then rise up, take you over, “become you,” and live through you. It needs to get its “food” through you. It will feed on any experience that resonates with its own kind of energy, anything that creates further pain in whatever form: anger, destructiveness, hatred, grief, emotional drama, violence, and even illness. So the pain-body, when it has taken you over, will create a situation in your life that reflects back its own energy frequency for it to feed on. Pain can only feed on pain. Pain cannot feed on joy. It finds it quite indigestible. Once the pain-body has taken you over, you want more pain. You become a victim or a perpetrator. You want to inflict pain, or you want to suffer pain, or both. There isn’t really much difference between the two. You are not conscious of this, of course, and will vehemently claim that you do not want pain. But look closely and you will find that your thinking and behavior are designed to keep the pain going, for yourself and others. If you were truly conscious of it, the pattern would dissolve, for to want more pain is insanity, and nobody is consciously insane. The pain-body, which is the dark shadow cast by the ego, is actually afraid of the light of your consciousness. It is afraid of being found out. Its survival depends on your unconscious identification with it, as well as on your unconscious fear of facing the pain that lives in you. But if you don’t face it, if you don’t bring the light of your consciousness into the pain, you will be forced to relive it again and again. The pain-body may seem to you like a dangerous monster that you cannot bear to look at, but I assure you that it is an insubstantial phantom that cannot prevail against the power of your presence. Some spiritual teachings state that all pain is ultimately an illusion, and this is true. The question is: Is it true for you? A mere belief doesn’t make it true. Do you want to experience pain for the rest of your life and keep saying that it is an illusion? Does that free you from the pain? What we are concerned with here is how you can realize this truth — that is, make it real in your own experience. So the pain-body doesn’t want you to observe it directly and see it for what it is. The moment you observe it, feel its energy field within you, and take your attention into it, the identification is broken. A higher dimension of consciousness has come in. I call it presence. You are now the witness or the watcher of the pain-body. This means that it cannot use you anymore by pretending to be you, and it can no longer replenish itself through you. You have found your own innermost strength. You have accessed the power of Now. 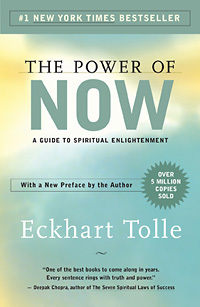 Eckhart Tolle is the author of the New York Times bestseller The Power of Now which is widely regarded as one of the most influential spiritual books of our time.